This is a very nicely presented video on wealth inequality in America. Among other things, compares peoples perceptions of how it is with their opinions on how it ought to be, and puts those both against reality. A bit slow, but eye-opening for most. A nice legal response from the Cleveland Browns. Judge Judy rules in 20 seconds. You got to love the dumb criminals. I want one of these amazing rings. It must be magic. Bill Gates is awesome in unexpected ways. Like a Rolling Stone – an interactive video. Clever. Sir Nicholas Winton meets the lives he saved. I like Kings of Leon. They tend towards the harder side of rock and roll, but I also enjoy their quieter songs. Here are a pair of songs from them that I can play over and over. They are easy to sink into. Kings of Leon are great craftsmen. They don’t do solos. Every note is carefully planned out. They are not stunning instrumentalists. The drummer is particularly very good, but for the most part they are all professionally competent. And you have to say the singers voice is… not so amazing. It’s a Bob Dylan or Jimi Hendrix voice, an acquired taste. From these ingredients, they have made a wide variety of really good songs and a couple great ones. 1) The fancy rims. The rims keep turning after the vehicle is stopped. That gives false visual information. At some level it appears that the vehicle is moving when it isn’t. 2) CDs and pendants hanging from the mirror that scatter and reflect light. Not only does the glare get in my eyes, but it does so in a random pattern making it difficult to adjust to. Everyone understands that having your brights on is rude. An old friend used to keep an enormous spotlight in his car, and if anyone behind him had their brights on too long he would shine right in their eyes. Those folks wised up quick. Visual clutter and disinformation is an actual issue. A friend of mine got in a car crash. The car in front of him was stopped, but the brake lights weren’t on, and he plowed right into it. None of this is because I am anti-bling. I am pro-bling, it amuses me. For instance, I am in favor of huge crazy spoliers on Honda Civics, and neon all over the undercarriage. It also amuses me that probably no one who has that kind of bling calls it bling anymore. There’s a more current term by now. I’m going back to the past. 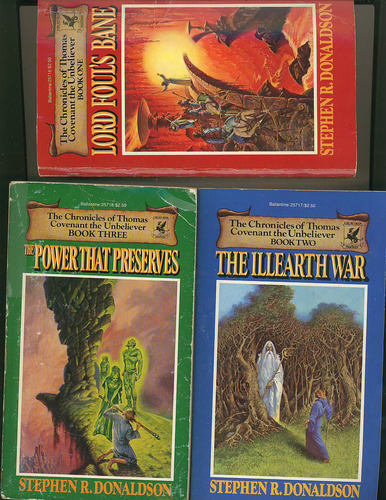 I haven’t read these books for over twenty years. They were some of my favorites back then. So far they are worse than I remember, but better than I expected.